Now that I am in my new shop, I have to start re imagining the space. 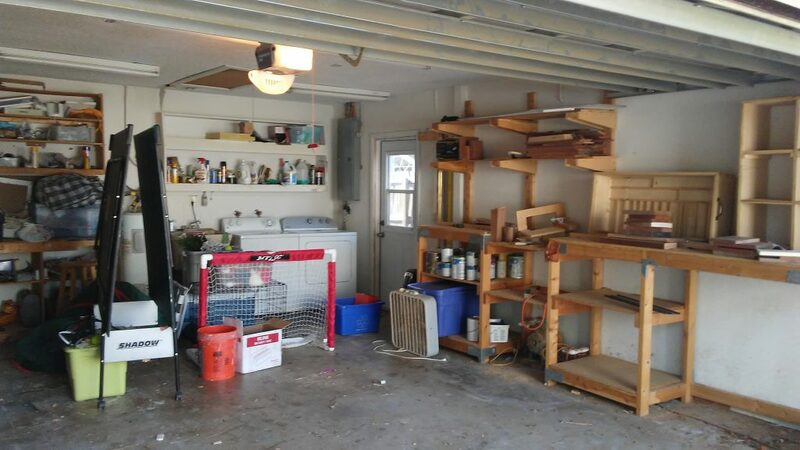 Going from a two-car garage where it was all mine to a one-car garage that will have to share the garage with a car, well, it’s going to take some time to get everything where it needs to go. But I know it will happen. Oh, did I mention that there is only one overhead light, and a single 15 amp plug that runs the garage door opener? Yeah, that will be a problem, but that’s the situation. So, as far as power tools go, my options will be limited, and I will be leaning heavily on battery-operated tools to make mechanized things work well. In the meantime, I need a solid foundation for my woodworking. Fortunately, I had a ton of help last year making things happen in my first apartment. 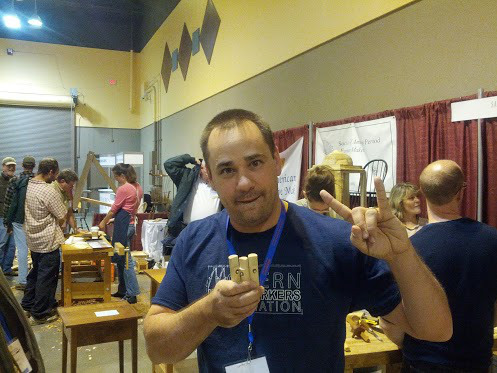 Modern Woodworkers Association Podcast Host and Penultimate Workshop Blogger Dyami Plotke paid me a visit just before the 2016 Woodworking Show to get me set up with a bench. Now, here’s a bit of a recap of bench history for those of you who are new to the party. My first bench – big ugly – was a solid core door I was throwing out that I mounted to a 2 x 4 frame. It was big. It was nasty. It was super ugly. And, I built some pretty sweet pieces on it. But, it had zero functionality. The next bench I built was better, but it too was plagued with issues that made its utility a bit more challenging. 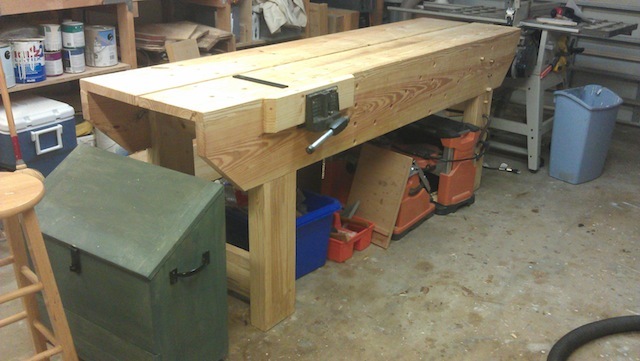 However, I was able to build some nice pieces on the bench, and it served me well for several years. The next bench was my favorite. It was a Nicholson Bench. Eight feet long. Heavy as all get out. All built out of construction-grade southern yellow pine. Now we were talking. Dog holes on the top and the sides. Stiff. Solid. Great piece to work on. Could have done without the split top, but hey, not bad for a third bench. The current one that Dyami and I built was a speed build – built in one day on the show floor at the Tampa Fairgrounds. Roll that fabulous bench building footage. While it is a sweet little bench (it measures a diminutive four feet long), it has yet to really see a woodworking project built on it. It ended up serving as an entry table at my apartment, catching ballcaps and cans of sunscreen spray. But, no more. Now, in its new location, the bench is getting set to get some work done. This past Friday morning, Rhonda and I sat in a judge’s chambers and finalized the divorce. That chapter in my life has closed, and with it, there was one other major item which needed to be finalized. You see, the tools in the garage were still there, and I had to get them out. So, I ran back to my old apartment, changed into some grubby clothes and packed my furniture and kitchen items for the next day’s move to my new place. You see, I had to wait until the mover was ready to go to the old house so I could move the tools out, so I burned time boxing up the last few items for the next day’s domestic move. At the appointed hour, I ran back to the old family home and found the garage door open, the tools ready to move. I spent the first half hour ensuring that everything was boxed up and ready to go. After that, I started wheeling what I could outside to the driveway to get ready for the movers. With everything just about dragged out of the garage, the movers showed up. Three guys. One truck. Swagger a plenty. I discovered that Monster Energy Drink is mover fuel. I warned the guys that some of the stuff was heavy, but they laughed, “We’ll let you know if it’s heavy,” said Mike, the leader of the crew. I looked at the bench. The band saw. The wood. I thought, “Holy smokes, it would take me a weekend to move this by myself …” As I stood there trying to calculate how much professional massage therapy it would take to fix my back, one of the guys brushed past me, thickness planer in hand like he was picking up a shoebox holding dainty ballet slippers. I got out of the way, and it all went onto the truck. All of it. One piece after another. They didn’t even need a lift gate. Up the ramp it went and it got secured to the walls of the truck with heavy webbing. The hardest part was the move of my old workbench. It did take all three of the guys to hoist it up onto the truck, but after a little bit of cursing, they finished and closed up the gate. They drove off, out of sight. I turned and looked back at the empty shop. The shelves I had built were still there. My drill press that a neighbor wanted was still there. There was PLENTY of sawdust everywhere. But, it was empty again. A garage. I hit the button, dropped the door and headed back to my new apartment. 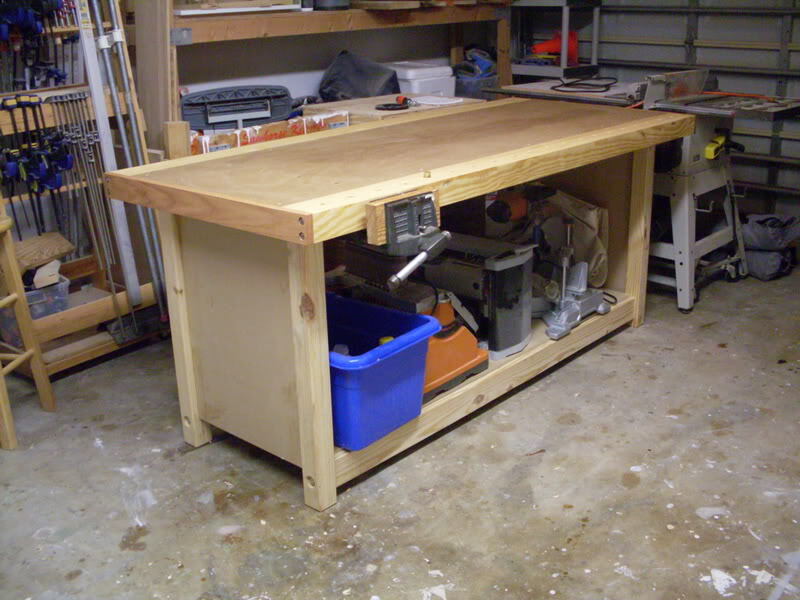 Time to set up my new shop in a rented one-car garage … and I have an idea of what my next woodworking project might be. It has been nearly 16 months since my last post to Tom’s Workbench. Since then, a lot has changed in my world. I grew some more gray hair. My oldest son graduated high school and went off to college. 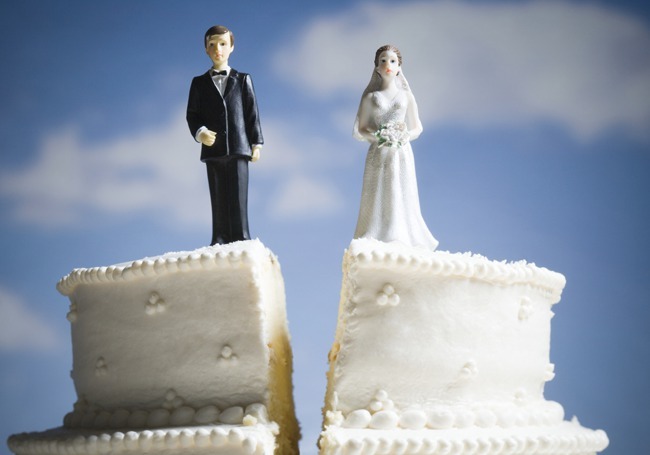 Oh, and probably most pertinent to this blog – I am in the final stages of getting divorced. Yes, that last change is the one that has tossed everything into the air for me. I moved out of my house in January of 2016, and have been living in an apartment since. I do not hate my ex wife. I do not wish her ill. Many of the problems we had in our relationship were my fault, and I have told her so and take full responsibility for them. 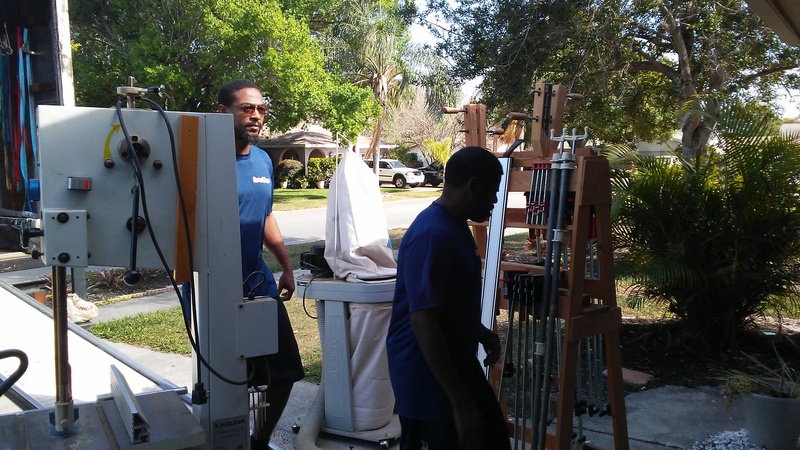 Part of this moving on process involves the shop – or should I now say garage – of the family home. That’s where 18 years worth of tools, memories and learning the craft of woodworking took place. And, now that we have reached an agreement, I have to re-imagine my woodworking and reduce the number of tools in the shop. 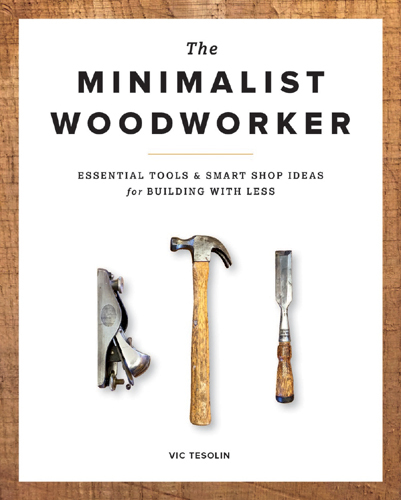 One of the greatest inspirations I have had during this process was the work of Vic Tesolin and his book the Minimalist Woodworker. 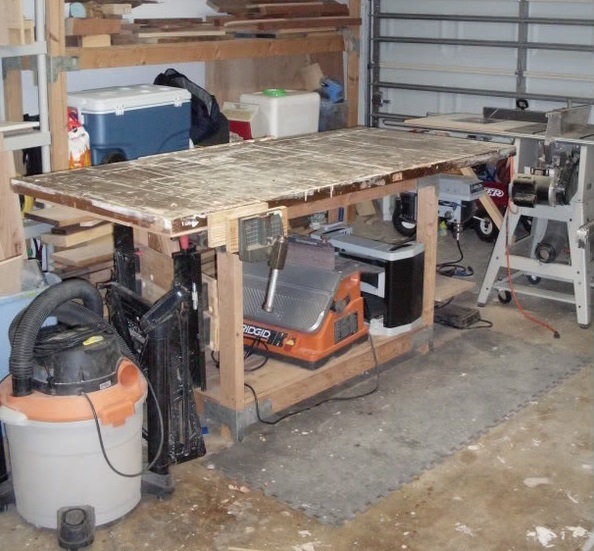 Vic’s observations included the profound realization that no, you don’t need a fully-stocked professional shop to crank out woodworking projects. A more modest collection of fundamental hand and power tools – paired with some easily built shop appliances – can do the trick just nicely. I also threw a few other ideas on that list as well. For instance, while no one would ever call a pocket screw a classic joint, they can prove indispensable for building cabinets. Armed with this list, I entered the garage to see the old, familiar tools I haven’t touched in more than a year. It could almost be described as a surreal experience. Things were obviously not arranged as I had them, but that’s OK. This space is no longer mine, and it is my responsibility to get it turned over to its rightful owner. Working with a few friends, I boxed and labeled what I wanted to take, and loaded those items into my buddy’s van. Those are going to my new workshop. 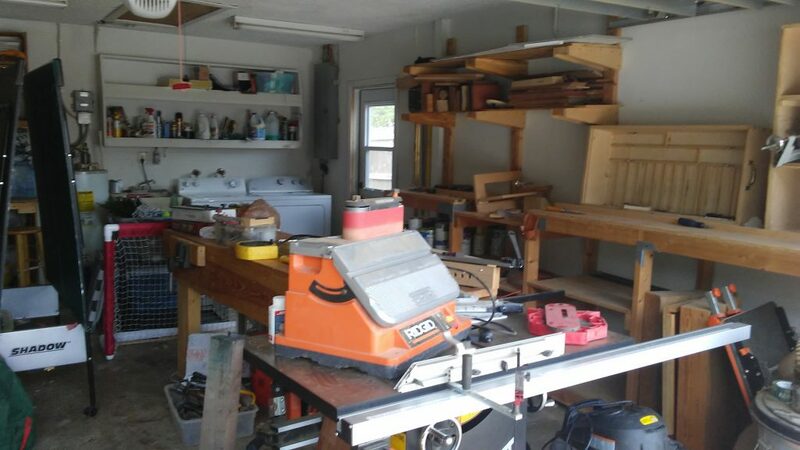 The other items that pain me to part with .. the table saw, band saw, dust collector, drill press.. well, I worked with the St. Petersburg Woodcrafters’ Guild. They agreed to buy those tools for pennies on the dollar and resell them, with the benefits going back to fund the guild. While it killed me to lose them, I knew they were going to good use, I wasn’t going to be paying through the nose for storage until a new, more permanent shop situation opened for me and I when I do replace those tools, I could get the latest and greatest safety features on them. Facing a future that was wildly different than the one I used to know. Nine years ago, I was but a wee lad, bright-eyed and bushy tailed full of vim and vigor. 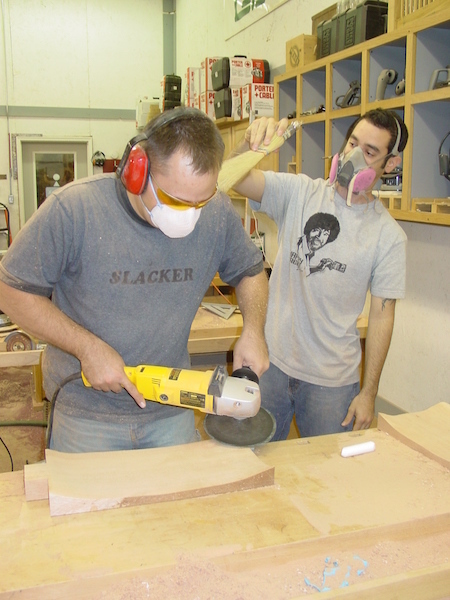 Marc Spagnuolo, my woodworking svengali, asked if I would be interested in writing a few guest posts for him. Oops, I guess I went a little overboard with the writing. And, for the first seven years of this blog, I adhered to my rigid posting schedule of four posts a week. Articles on Monday and Wednesday, the Link of the Week on Friday and the Quick Poll on Sundays. Believe me, it was a ton of fun, but it was also a ton of work. On average, I was spending anywhere between 12 and 15 hours each week – every week – on the blog to meet my self-imposed deadlines. It was a thrill. I was in demand, asked to speak at – and later serve on – the board of directors for the local Woodworking Guild. I started attending woodworking meet-ups. Heck, I even got the attention of sponsors. Companies such as MicroJig, Infinity Cutting Tools, Tormek, Bora Tools, Bell Forest Products. Laguna. Eagle America. 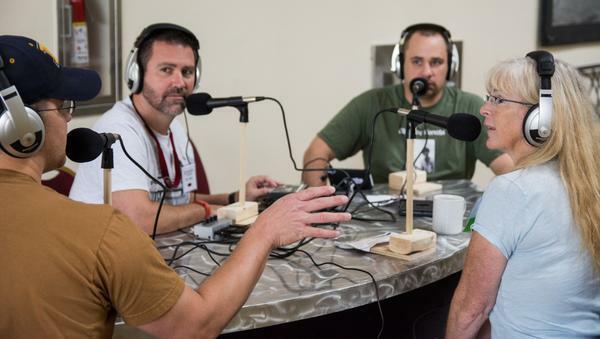 I was asked to join Dyami Plotke and Chris Adkins on the Modern Woodworkers Association podcast, and I have met so many interesting and awesome folks. Then, I realized something. It wasn’t all of a sudden, but it had been building over the past year. 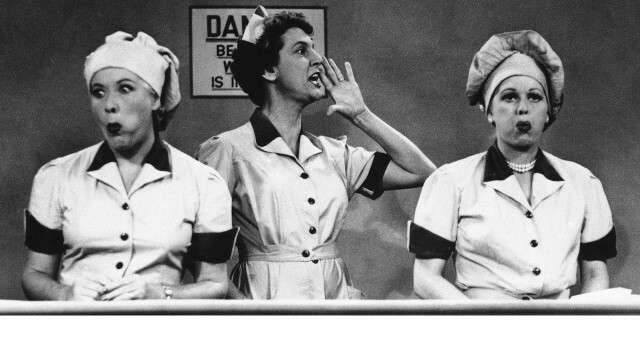 I am starting to feel a little like Lucy Ricardo, joined by her friend Ethel Mertz on the candy wrapping line. Suddenly, instead of getting all of the candies wrapped beautifully for packaging, I was rushing to just get them out. Sunday night would roll around and I would look into the shop in terror and panic, realizing I hadn’t done any woodworking, but I had to write SOMETHING. Basically, I’m discovering that I just can’t maintain this second job, my primary job and my sanity all at once. That being said, it pains me to make this announcement. Effective today, I will be putting Tom’s Workbench on an indefinite hiatus. Does this mean the site is going away? No. I will continue to maintain it so you can go back and check out the articles I have written. Does this mean I am going to crawl away into a cave and disappear from the face of the planet? Nope. I will still post to Twitter and Google Plus as I finish projects and seek the wealth of advice of the woodworking community. What it does mean, however, is that I am going to get a little much-needed balance back into my life and spend some of the time I have been writing about woodworking to actually get back into the shop and do some of it. Isn’t that why I have all of those tools in the first place? 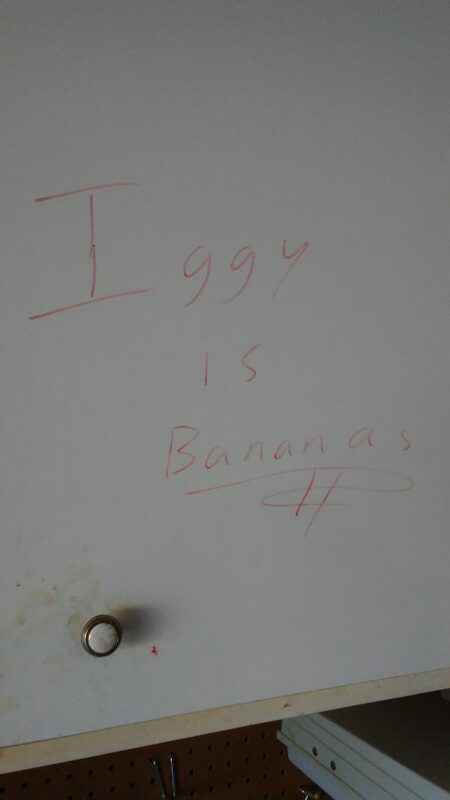 In the meantime, please e-mail my Trained Shop Monkey at iggy@tomsworkbench.com if you have any questions, and be sure to get some time for sawdust therapy. Trust me, you need it! Mele Kalikimaka from the shop! Our final Last Minute Elf winner comes from our friend Doug Moulder who just blew me away with his entry. Again, very simple (once you get the hang of it) and elegant. 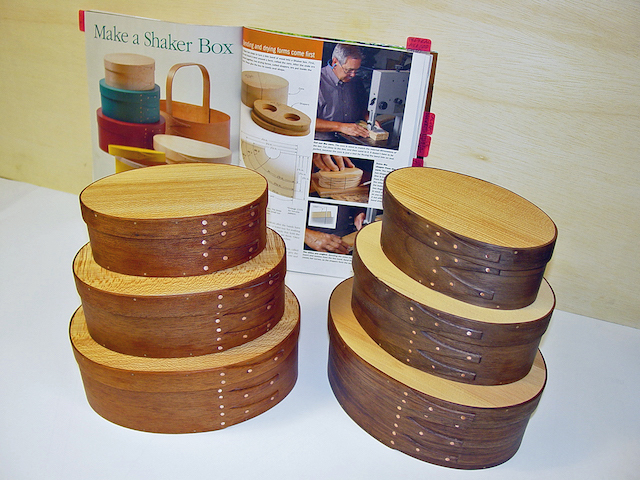 Here’s two sets of Shaker oval boxes that I just finished making for my sister’s Christmas present. 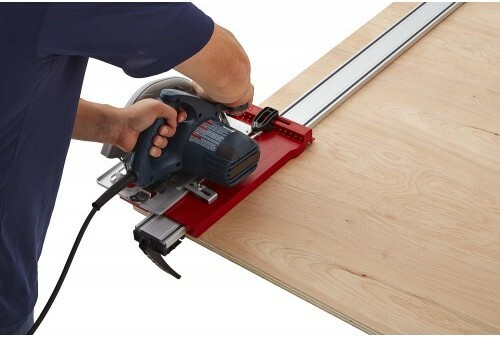 I got all the information on “how to”- from the May/June-No.247 issue of Fine Woodworking-pages 38-43, by Pete Baxter. The video (Matt Kenney) on FineWoodworking.com/extras. It was great on watching how to do the bending. They are pretty quick to make after you make the bending and drying forms, and practice some on the bending technique. I don’t care how they were built, they are stunning. Very well made and executed. Who wouldn’t want something like a set of those in their home? Doug, since getting nice, straight cuts is essential for that kind of work, our friends at Infinity Cutting Tools want you to have a super-premium blade to make sweet cuts. 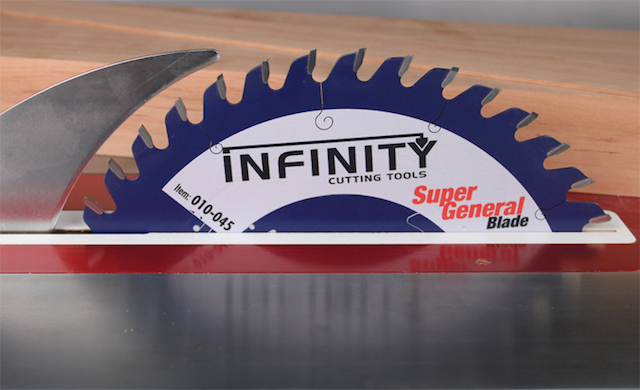 That’s why Infinity Cutting Tools will be sending one of their Super General Thin Kerf 10″ saw blades. They are a very cool blue, easy on the ears and leave a beautiful cut line. Congratulations, Doug! Hope you enjoy it! Up on the workbench! Quick! Quick! Quick! Day three of the Last Minute Elf, and we have a stunner of a project for you from our friend Mike Boulant. 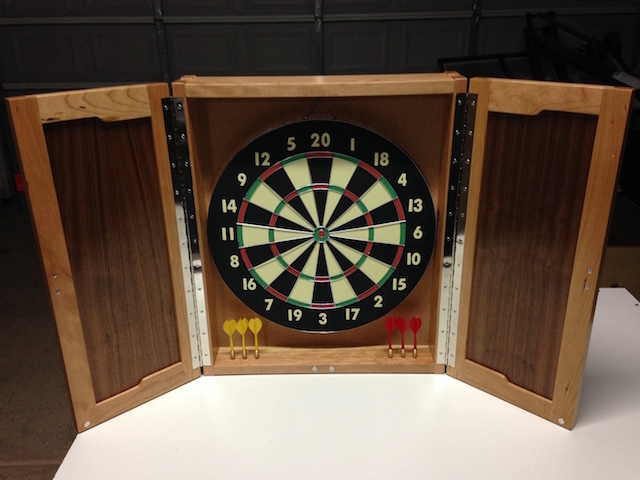 These photos are 2 dartboard cabinets I made for my brother and brother-in-law this year. These were two of the most complex projects I have attempted, but there wasn’t a ton of material and it only took 1 day to get all the components milled and cut to final size, including the joinery. So the time criteria should count as a last minute elf project. What took the remainder of the time (approximately 2 weeks) was the finishing process. I used Arm R Seal for the first time. The dry time between coats is MUCH longer than I am used to with spray lacquer. I pre-finished all of the door panels and interior parts because I was worried of messing up the cork on the back and I figured I would get better results that way. I ended up doing about 4 coats of gloss and 2 coats of satin for the final top coats. I sanded between each coat with 360 grit and 600 for the final coat. 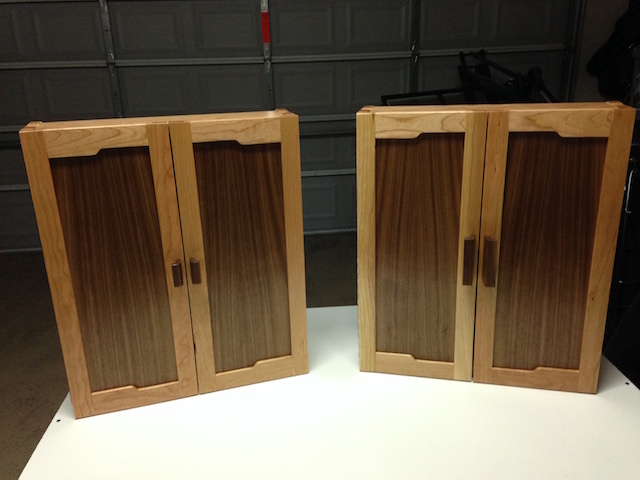 I used 4/4 Cherry for the case and veneered the 1/4″ MDF door panels with walnut. My inspiration for the project came from two sources. Initially, I watched Brian Grella’s video series on his cabinets. I took the inspiration for the cloud lifts on the doors from him. But I love the chunky box joints for the case construction that Marc Spagnuolo has used on some of his pieces. I’m proud of how these turned out and hopefully they will be enjoyed for years to come. Wow, Mike, I’m gonna tell you those are some impressive gifts. And, since you said that finishing was one of the problems you experienced with the piece, well, do you have an awesome piece of tooling coming your way! 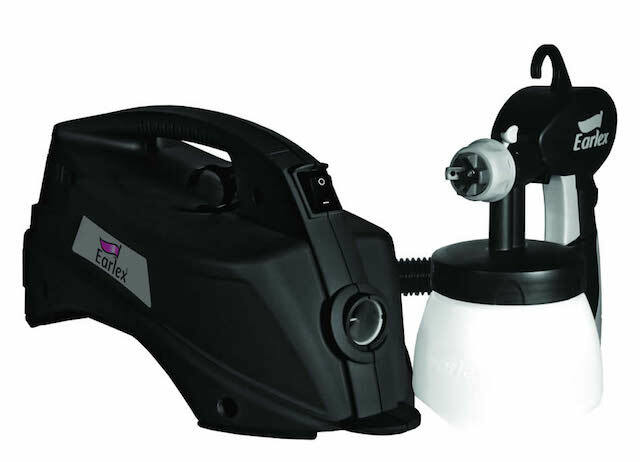 How about an Earlex Spray Station HV2901, which will allow you to get into the wonderful world of spray finishes – and the efficiency of an HVLP system. Use it in good health, and we look forward to the other projects you have up your sleeve in the future! You know, for the past eight plus years I have been doing this blog, I have been thoroughly impressed by the creativity of the readers when they have sent in projects for contests and when they just want to show them off. Today’s Last Minute Elf winner is no exception. 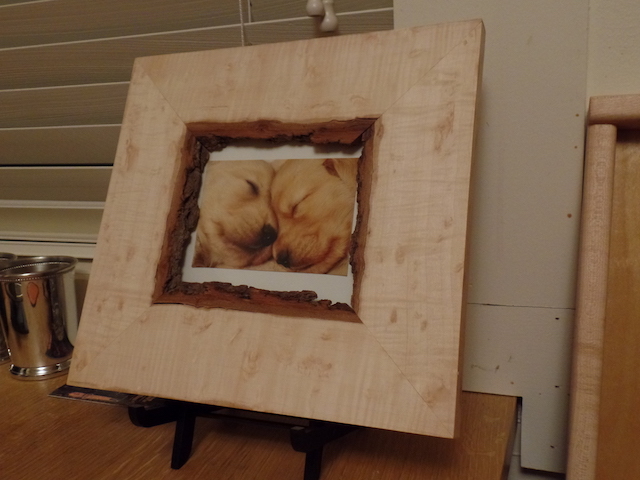 Here’s a live-edge picture frame made from some curly maple rescued from the firewood pile! Makes a nice impression, at zero cost. The FIREWOOD PILE! Holy smokes, now that would have been a huge loss had been turned to ash. Not only does Steve’s project meet Last Minute Elf specs, it also gets the cheap elf stamp of approval. A project that sweet deserves a sweet prize pack! So, Steve, when you find yourself out in the field trying to get some awesome straight line cuts, our friends at Bora Tools want to send you their WTX 50 inch saw guide, the 50 inch extension (that’s 100 inches of cutting length!) and their Bora Saw Plate. We have a few more days left in the Last Minute Elf event, so if you have any ideas you want to submit, my hairy shop assistant Iggy is standing by! Be sure to shoot him an e-mail at iggy@tomsworkbench.com.